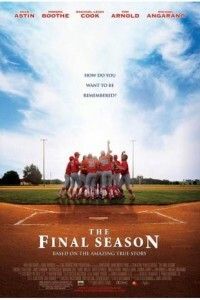 Directed by David Mickey Evans (“The Sandlot”), “The Final Season” is based on the true the story of a small town baseball team facing insurmountable odds. Tradition in Norway, Iowa (pop. 586) can be summed up in one word, Baseball. From father to son, generation to generation, this high school David exists to defeat Goliaths ten times its size. As Coach Jim Van Scoyoc (Powers Boothe) leads the team to its 19th State title, it seems following it with a 20th is a forgone conclusion. The unexpected strikes when bureaucracy intercedes merging the town with another. Petty jealousies and political designs conspire to rob Norway of its heritage and a 20th Championship. Making matters worse, legendary coach Van Scoyoc is fired and replaced with a one-season assistant coach, Kent Stock (Sean Astin) – a move that seems to guarantee the team’s failure. “The Final Season” is a film about the sudden nature of change, the identity of a small town and the strength that brings out the best when we need it most. Based on a screenplay by Art D’Alessandro and James Grayford the film also stars Rachel Leigh Cook, Michael Angarano and Tom Arnold.